I have been navigating this cyberspace for 7 years now. I’ve had many great experiences, learned and shared many things, and met many great people. I’ve changed my view along the way and rethought my audience, but have always tried to write things that were engaging to my readers. Often I could gauge that engagement by how many people commented on my posts, and/or how often readers connected with me on Twitter or Facebook regarding my writing. So…while I honestly write as a means of reflection, I also strive to make this blog a conversation around teaching and learning. And I’ve found that recently I seem to be writing to myself…I figure there are many reasons that might be happening, but am hoping that maybe you’ll help me more specifically with figuring out some of them by answering some questions. I’d LOVE to learn more about what you, my blog reader, is thinking! What kinds of blogs do you read and revisit often? What kinds of blogs do you comment on, and what makes you want to do that? Do you find yourself reading blogs/posts that are more word-focused, video-focused, photo-focused, or some combination of all of those? If you write a blog, what do you do to help invite conversations and interactions? One of the things that happens to over-thinkers thinkers like me is that there are often loads and loads of jumbled thoughts all up there in my head at the same time. I find it a very rare occurrence that I am only thinking about or planning thing at a time (is this called multi-tasking or just crazy?!). Today is one of those days when there are many things filling the space between my ears, and so as a means to think some of it through, I’m writing about it. This weekend means that yes, I’m “off” because it’s not a school day, but when you’re a teacher you’re never really not not thinking about school or how to make your classroom a better place for the learners you spend every day with. Today this thinking was magnified as I was attending #edcampStl (Ed Camp St. Louis), learning and growing with other fabulous educators. Teaching Artistic Behaviors–100% Choice Learning: Today I went to a really great EdCamp session with Kelly Lee (@yogagirly). I wasn’t really sure what I was in for (but thought maybe it was how to add more art/design into regular subjects), and then I found out it was by an art teacher and I was really more unsure (I have a good record of picking badly by the title of the session…). It ended up being something really inspirational, and now I’m trying ot figure out how to use her ideas in my own classroom with 2nd grade. The basic premise is that in her art class, Ms. Lee has her room broken into “studios” based on mediums (collage, drawing, fiber, digital and painting). Each day, artists listen to SHORT lesson or inspiration (based on a concept, artist, etc.) and then choose which studio in which to work for the day. In their plan book, students make a goal and plan for the class time, and then spend time in that studio working to achieve their personal goal. At the end of the class time, 5 minutes is provided for reflection on the day’s work. As I sat and listened, I tried to imagine how I could tweak this idea to include all the subjects I teach, perhaps with just 5 studios (or decks since we’re working on being pirates!) that would work for everything we do. Right now I’m trying to decide if something based around the multiple intelligences would work…. Biography as Narrative Non-Fiction: I am not sure if I’ve mentioned here before that my team does a really cool thing with planning, and each person (there are 5 of us) is responsible for creating the plan for everyone for one subject. I’m in charge of writing, and so I’ve had the opportunity to share some exciting things with my teammates (and therefore their students!) this year, like blogging, a new way to think about Writer’s Notebooks, and a punctuation study. Right now we’re about to start a new unit–biography per the curriculum calendar–and I’m having a hard time getting started. I remember teaching that unit with 4th and 5th graders and it was BRUTAL! I’m really not so excited about 1) trying to write that genre with little kids, and 2) planning a non-fiction unit right after we did one (we’re all working on creating picture books about the cultures we’re researching in Social Studies). So…I’ve been on the search for some fresh ideas of how to teach biography to young writers and help them be able to successfully write about inspirational characters–most of whom are probably from long ago and hard to understand. I know that I want to include lessons on important vs. interesting information, as well as investigations into the elements of a biography as well as the definition of a paragraph, but beyond that I am dreading the whole thing! I ran across a unit online the other day, though, that explains how to write biography as a form of narrative non-fiction, rather than expository or descriptive non-fiction (which is what we’ve been doing anyway). I like the idea of trying something new, as well as thinking about how this could be a good transition between NF writing and the narrative fiction that we’re doing next. This could be the bridge. Most of the texts we share with students are written in this genre anyway, so it might not be as hard as maybe I first thought….. This wrapper was funny to me because it came from a friend the day after my coach and friend, Amy, had reminded me of this question when we were talking about 100th Day Questions. Just now as I was in the middle of saying how I didn’t think it was the right thing to do to just abandon our work and PLAY, I was reminded of what I say I’m about; play and fun and laughter are important parts of the learning we do together. So….see why the thoughts are all jumbled? Who knew teaching 2nd grade would be so hard!? It’s the parties and fun parts that make me crazy, not the curriculum! (Maybe it’s me who’s the crazy one…). Have any suggestions? I’d love to hear your thoughts on any of my jumbled thinking. 🙂 Remember, it takes a village! This whole 100th Day of School thing has got my head spinning. 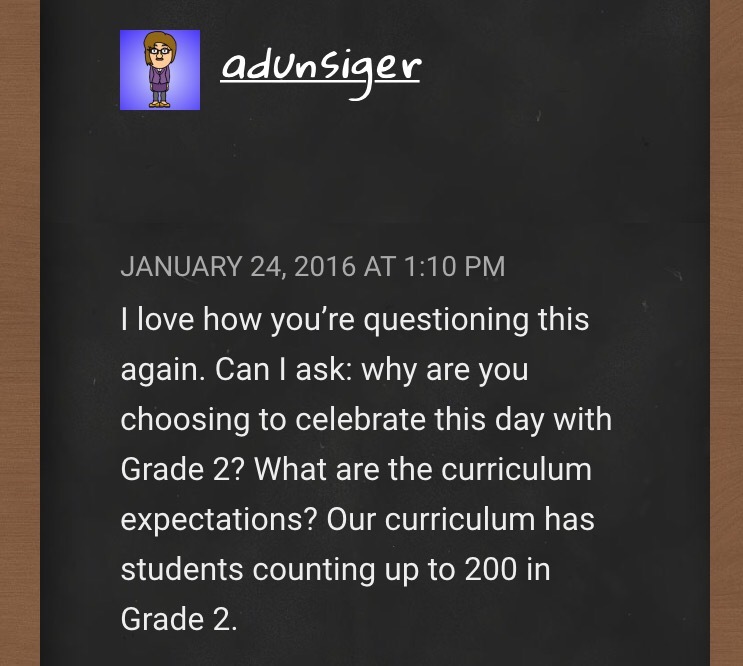 Last year I thought I had answered the question (at least the 1st grade version of it), but then it came to rear it’s ugly head again this year as last week people starting talking about it and planning again for the “holiday” that falls on Thursday, January 28 in our school. So I started thinking again. And you, kind blog readers and Twitter friends, helped my thinking along by asking some really good questions. Now here’s where I got a little uncomfortable, because I realized my answer wasn’t as nearly as strong as I thought. Well actually, I didn’t even have an answer at that point, because I was asking a different question altogether! Um, yeah. Not my best day. ESPECIALLY as a teacher who likes to pride herself on not just doing things because everyone else is or because they always have been done that way. So as the title suggests, I did just what I told Aviva I was going to do, and asked my class to weigh in on the whole deal. (By the way, as I was telling them this story and was about to say what our next step was, Makayla said that she knew I was going to ask them about it. Love that they know my moves!). We went on to talk about the origin of the 100th day celebration (which I believe is in kindergarten when kids have actually been in school for 100 days, right? ), and I wasted Aviva’s question: “Why do we celebrate this day in 2nd grade? Is 100 really a big deal to us now?” They agreed that no, it’s not. We’re working on time, money, we’re going to be adding to the 1000s, and we can count WAY higher than 100 already. It WAS a big deal a couple of years ago, but that number is not such a landmark for us anymore. We decided that our focus would be on looking back at our learning and reflecting on the many things we know how to do now. With that in mind, we went back to our list to revise; we would only keep things on it that had to do with reflection, not the parts that were just about 100. Basically the things that were related to the number 100 were crossed off, although we realized that we had a pretty good list of reflection activities already. 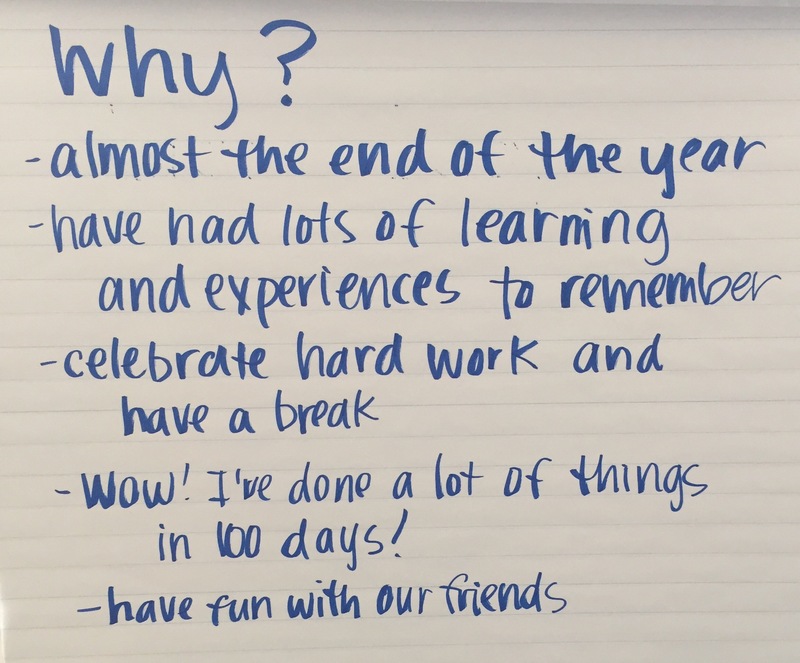 As we revisited our ideas, we crossed off ones that were “number based,” as well as the blog posts and reading 100 books because those were things we did last year. We decided 100 math problems was something we always do anyway, and that 100 facts about places was just what we were doing in Social Studies and so we’d wait on that, too. The writing and notebook entries were also typical to our daily schedule. The 100 post cards was crossed off because we’ve been working on letters in Writers’ Workshop and that would make more sense that post cards. Pretty valid support, I’d say. You have to use problem-solving to figure it out. You have to have self-control and keep it together if you get frustrated. You have to use grit. It’s a challenge (especially if there’s a lot of pieces!). It takes a long time so you have to be willing to work hard. So armed with our new list and some renewed excitement and understanding about the reasons behind this day, we’re getting geared up to have a great day of learning, reflection and fun on Thursday. Can’t wait to share it with you! Last year I made a jump down to primary after teaching “big” kids for the previous 9 years. When I last taught 1st graders there was no such thing as celebrating the 100th Day of School. So when that day came near, I began to consider (like I do with everything else that fits into the “it’s-what-we-do” or “it’s-the-way-it’s-always-been-done” category) what we should (or shouldn’t) do on this day in Rm. 202. I asked many of my own questions, as well as having conversations with others who were asking the same things. We ended up deciding on taking on a pretty big challenge in our classroom to write 100 blog posts, and secondly to try to read 100 books. It was a great day of fun, learning, stretching our brains, working together, solving problems and really figuring out just how big 100 is! It took us all day, but we made our goal of all of those blog posts and boy, were we proud! So…as we near the 100th day again (next Thursday! ), I’m asking 100th Day questions again. If I have certain thoughts and feelings about it in regards to 1st graders, how do those apply when I’m now teaching those friends as 2nd graders? Unlike last year, I decided to take that question to my kiddos. I explained my thinking, and we talked about what we should do; probably our challenge should be bigger than the one we took as 1st graders, right? We decided to brainstorm all of our smart ideas (thanks Landen for volunteering to be our recorder!) and then whittle them down from there. While it’s true that there are no “bad” ideas when you’re brainstorming, we did agree to only add things that we thought would truly be challenges for us, and not just things that were “fun” or “cute.” I’d say that they did a pretty good job of coming up with some fun and meaningful choices. But how would we decide which of those were the ones we end up doing? We are currently in an opinion writing unit and I took this as a great opportunity to continue to hone our skills of sharing our thoughts, giving strong reasons and relevant evidence. So, kiddos were asked to write me a letter (which we’ve also been practicing) to tell me their top 3 choices, along with 3 good reasons why they want to do those things on our 100th day. What a meaningful and engaging way to put all of our new skills to work! We haven’t made any final decisions for our big day, but the front runners right now seem to be puzzles, the 100 dot design challenge (building), playing the 100 game (which is something we do regularly in math), and playing board games. Can’t wait to see what we end up choosing, and then documenting what actually happens–stay tuned! I’d love to hear about your 100th day questions and thoughts! Leave me a comment and let’s chat about it!